God has given humanity the beautiful gift of music for our joy and for His glory. Here at BJU you’ll explore the intricacies of music through careful study and concentrated practice under highly qualified and experienced faculty. Whether you’re improving your skills with your instrument or learning how to use technology to compose, record or mix music, you’ll grow in your knowledge and appreciation of music. And you’ll learn why excellent musicianship is important—especially for believers—and how to pursue that excellence in a way that displays the manifold perfections of God. Within the orchestral instrument performance program at BJU, you’ll build a solid foundation in theory and technique. You’ll learn how elements—including tonality, harmonic sequences and chromaticism—work together to create coherent and expressive music, and you’ll learn how to use each element to create compelling music. You’ll sharpen specific skills in performance so you can grow as a musician and play your instrument expertly. In addition, you’ll build a solid foundation in music history, from ancient music through contemporary. Each period of music will help you understand how society and culture influence music and how Western music has developed through the years with the introduction of new instruments, styles and technologies. You’ll work closely with your professors beginning at your initial audition. From there, you’ll work with caring faculty members who know what it takes to be a performer and who will customize the way they teach to meet your needs so you can excel as a musician, expand your repertoire and perform at your very best. Liberal arts courses, such as economics, philosophy and speech, will challenge you to see life from a broader perspective. These subjects will also help you develop essential life skills such as critical thinking, problem-solving, creativity and effective communication—skills necessary for flexibility in your career. The importance of communication skills cannot be overstated for a musician, and these core courses will enhance your powers of expression. In addition, your Bible courses will connect your pursuit of God to all of life, including your work as a performer. These courses will encourage you to make your relationship with God your top priority, and to view your ethics and practices in your career through God’s Word. And more importantly, you’ll learn how you can point others to the beauty and holiness of God and the hope found only in the person and work of Jesus Christ. Orchestral instrument performance is an involved program, and much of your course schedule is already predetermined, with the exception of your second instrument concentration. If you wish to take additional Bible or liberal arts courses, be sure to explore the option of online courses via BJUOnline. I chose Bob Jones University because I knew I could trust the spiritual, musical and academic content of the education I would receive. I have not been disappointed! The rigorous liberal arts core challenged my thinking and prepared me to interact professionally with future colleagues and students. My music classes and performance opportunities honed my skills and offered me real-life experiences that will be an asset in my future endeavors. I am thankful for the variety and abundance of performance experiences I received here (band, orchestra, opera, small ensembles, competitions and tours) that are not available to my peers at other institutions. However, the spiritual climate has impacted me the most. The emphasis on doing all—from Bible, English and science, to music theory and opera—for the glory of God will influence me for the rest of my life. I am thankful for the faculty members in every department who communicated passion for the Gospel in and out of the classroom. My teachers not only taught history, hermeneutics and counterpoint; they taught students. And they have inspired me to do the same. 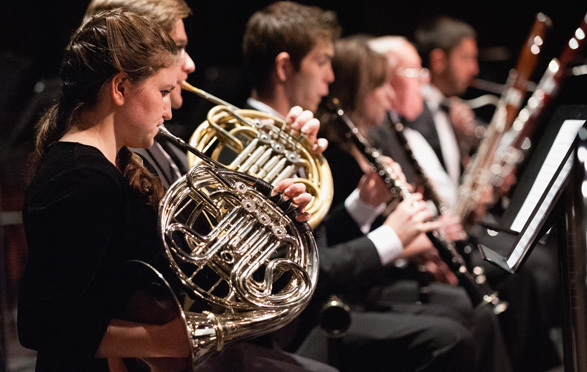 The orchestral instrument performance program at BJU opens the door to many career possibilities. 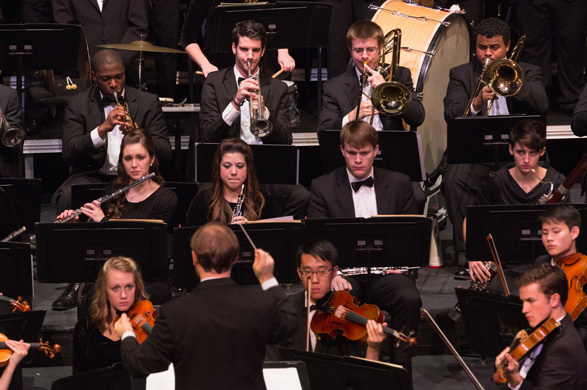 Membership in the University’s bands, orchestras or choirs will provide you with unparalleled opportunities for further development of your musicianship under the direction of our accomplished faculty conductors. You will also be challenged to achieve your best in your chosen principal through private lessons, culminating in a senior recital. Once you complete your platform check during your sophomore year, you’ll prepare for two recitals: one in your junior year and one in your senior year. These recitals are a significant part of the performance program and play a major role in preparing you for your profession. Each of these recitals is designed to help you build your repertoire and teach you how to prepare for performances. Additionally, you’ll be exposed to accomplished artists in the Concert, Opera & Drama Series, such as the King’s Singers, Canadian Brass and Prague Symphony Orchestra. You may have an opportunity to perform under professional guest conductors in productions that are part of this series. Music practice is invaluable, and we have a number of resources available to help you master your instrument. Practice rooms are available in 4 buildings campus-wide, and you can take advantage of a music computer lab that is equipped with composition software such as Finale and MuseScore. BJU’s orchestral instrument performance faculty are graduates of some of America’s finest graduate schools. Many currently perform in area orchestras such as Greenville Symphony and Spartanburg Philharmonic orchestras. Some have also been winners in prestigious national contests such as the MTNA Collegiate Brass graduate division and the Holland America Music Society. Apply knowledge of performance practices, music history and music theory relevant to performance settings. Evaluate literature, materials, methods and technology used in successful studio teaching. Perform public recitals that apply mature musical interpretation and advanced instrumental skills.